This lovely CD was not at all what I expected. The image I had of church music was of a genre that is conventional and safe. Neither composer represented here falls into place on either count. I suspect many a church choir would see these pieces as very challenging. The scene is set with Filsell’s Tomorrow shall be my dancing day which is lively and thoroughly entertaining and makes it obvious that the Vasari Singers are a very classy group indeed. The Epitaph which follows is also enjoyable and musically interesting including some lovely effects for double chorus. If God build not the house is again lively and has a positively triumphant opening. The organ part is not for the fainthearted. Here it is in safe hands, those of the composer himself, who is a virtuoso organist of the highest standard. The prayerful central section tickles the ear with unexpected harmonies. This is a big piece in every respect except length: it has a real sense of structure as well as scale. The ending is appropriately quiet and contemplative, setting the words ‘And draw the curtain to his sleep’. The registrations chosen by Filsell on the organ in quiet passages draw attention to the first class engineering of this spacious and true stereo recording: I say true because it sounds believable and accurate, high praise coming from me. Filsell’s canticle Magnificatis the first of four selections from his so called Windsor Service, and includes a highly ornamented organ part. One cannot but note the composer’s sensitivity to the words and he varies the music substantially given its short duration of less than five minutes. The canticle Nunc Dimittis treads slowly from quiet to loud music, again with extensive ornamentation in the organ part. The ending is triumphant. The Transfiguration is mostly slow music punctuated by a mixture of decorative figurations and dramatic outbursts from the organ. The biggest of Filsell’s pieces on this disc is the Te Deum. In this and the following Jubilate the composer aims for brevity and in common with the preceding pair of canticles the organ indulges in yet more decorative ornamentation. There are a lot of words to fit into a mere nine and a half minutes – think how long Berlioz and Bruckner took – but it never sounds rushed. Again Filsell displays much skill and imagination in reflecting the meaning of the words and uses the full dynamic range of these thirty excellent voices. The Jubilate contains appropriately joyful sounds from singers and organ ending with haloes of sound. Briggs is no less absorbing a creative artist. The Pange lingua is a cappella, a commission from these singers. The crunching opening chord makes one really sit up. A beautiful, lyrical outpouring follows making many demands on the singers. The linked organ improvisation is serenely beautiful. The final work is also the most substantial. Briggs’ Missa pour Saint-Sulpice is almost twenty-seven minutes long: a big work with grand gestures but also much uncertainty. To my ears this music is not a confident expression of faith but a quest for understanding. The Kyrie is introduced by the organ with the choral appeals for mercy expressed quietly, quite unlike many mass settings. 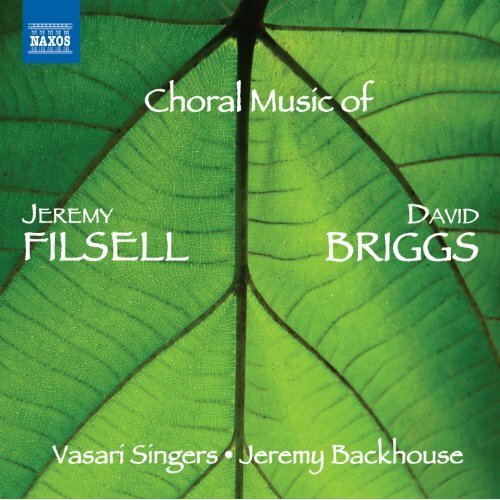 The Gloria proper, after theintonation, is introduced by the organ – and I should note that here too the organist is the composer, like Filsell, Briggs is a superb musician with a reputation to match. The Et in terra pax is a rather serious first statement before a big choral outburst on Laudamus te. Domine Deus is more pensive than confident. Again like Filsell, Briggs is very aware of the words and has a definite take on the meaning. The music grows more impassioned towards the Quoniam which is impressive and tense. The four lines of theSanctus text move carefully from muted praise towards a single cry of ‘Hosanna in Excelsis.’ This shows remarkable restraint when one considers how many ‘Hosannas’ get multiple repetitions elsewhere in the choral literature. This is a clever compositional ploy injecting a different feeling into the words. TheBenedictus is quiet and contemplative with a muted second Hosanna not at all like Bach or Vivaldi. TheAgnus Dei is very obviously an appeal for mercy: it grows in intensity through repetition and finally subsides to the last call for peace. Here Briggs gives the high voices a striking line to close the work. I enjoyed this disc enormously and would urge music-lovers to buy it at once and wash away their preconceptions. I can’t say what it will do for their sins but it will grace their listening time.